Lotus berthelotii is a perennial plant endemic to the Canary Islands, in the genus Lotus. This plant is either extinct in the wild or persists as a few individuals. In 1884 it was already classed as "exceedingly rare" and plant collection probably hastened its decline. The plant has a creeping or trailing habit, with leaves divided into 3-5 slender leaflets, each leaflet 1–2 cm long and 1 mm broad, densely covered with fine silvery hairs. The flowers are orange-red to red, peaflower-shaped, but slender, 2–4 cm long and 5–8 mm broad. 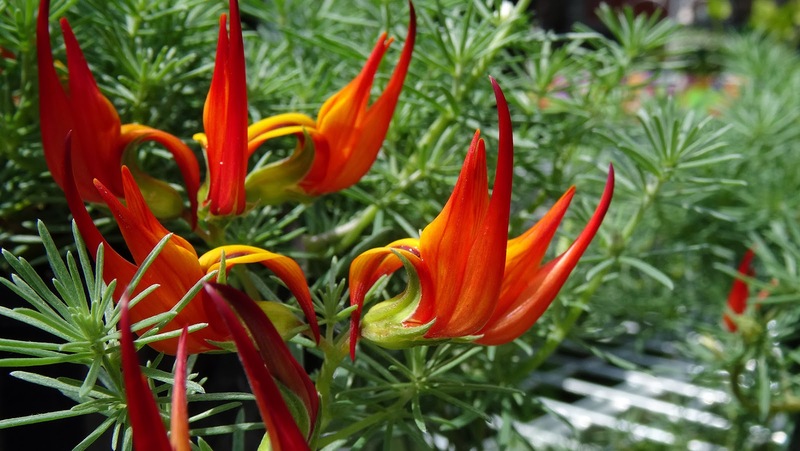 Lotus berthelotii is cultivated in the horticulture trade and widely available as an ornamental plant with its needle-like silvery foliage and red flowers for traditional gardens, container (pots), and drought tolerant water conserving gardens. A golden orange flowering cultivar is also grown. Fuchsia is a genus of flowering plants that consists mostly of shrubs or small trees. The first, Fuchsia triphylla, was discovered on the Caribbean island of Hispaniola (present day Dominican Republic and Haiti) in about 1696–1697 by the French Minim monk and botanist, Charles Plumier during his third expedition to the Greater Antilles. He named the new genus after the renowned German botanist Leonhart Fuchs (1501–1566). 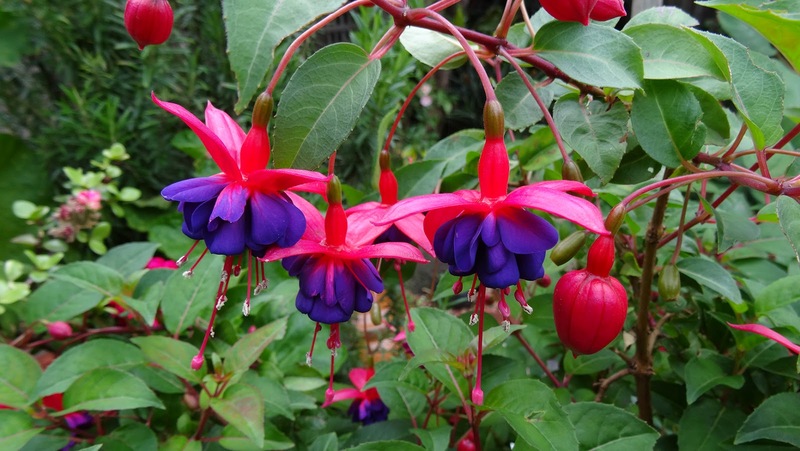 There are currently almost 110 recognised species of Fuchsia. The vast majority are native to South America, but with a few occurring north through Central America to Mexico, and also several from New Zealand to Tahiti. One species, F. magellanica, extends as far as the southern tip of South America, occurring on Tierra del Fuego in the cool temperate zone, but the majority are tropical or subtropical. Most fuchsias are shrubs from 0.2–4 m tall, but one New Zealand species, the kōtukutuku (F. excorticata), is unusual in the genus in being a tree, growing up to 12–15 metres tall. The cultivar shown here, 'Blue Eyes' was hybridized by Reedstorm and its year of registration was 1954. Acca sellowiana, a species of flowering plant in the myrtle family, Myrtaceae, is native to the highlands of southern Brazil, eastern Paraguay, Uruguay, and northern Argentina, and Colombia. It is widely cultivated as a garden plant and fruiting tree in New Zealand, and can be found as a garden plant elsewhere such as in Australia, Azerbaijan, West part of Georgia, South part of Russia and South Africa. 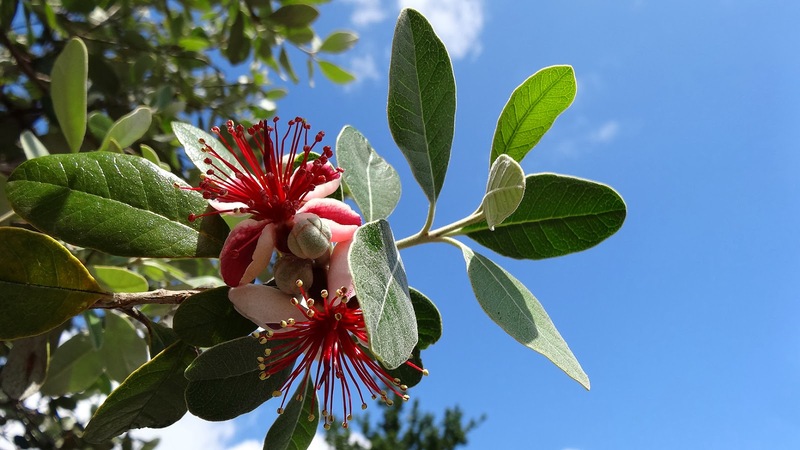 Common names include feijoa, pineapple guava and guavasteen. It is an evergreen, perennial shrub or small tree, 1–7 metres in height, widely cultivated as a garden plant and fruiting tree. The German botanist Otto Karl Berg named feijoa after João da Silva Feijó, a Portuguese botanist born in the colony of Brazil. The flower petals are edible, with a flavour that is slightly sweet with hints of cinnamon. The most common use is as an addition to salads. They regularly are consumed by birds. The fruit, maturing in autumn, is green, ellipsoid, and about the size of a chicken egg. It has a sweet, aromatic flavour. The flesh is juicy and is divided into a clear gelatinous seed pulp and a firmer, slightly granular, opaque flesh nearer the skin. The fruit falls to the ground when ripe and at its fullest flavour, but it may be picked from the tree prior to falling to prevent bruising.The fruit pulp resembles the closely related guava, having a gritty texture. The feijoa pulp is used in some natural cosmetic products as an exfoliant. Feijoa fruit has a distinctive, potent smell that resembles oil of wintergreen. The aroma is due to the ester methyl benzoate and related compounds that exist in the fruit. 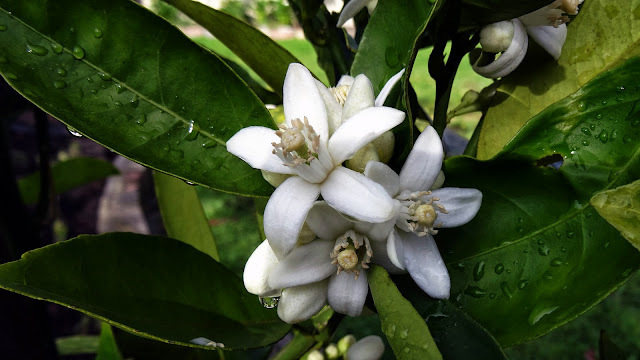 The orange blossom is the fragrant flower of the Citrus sinensis (orange tree). 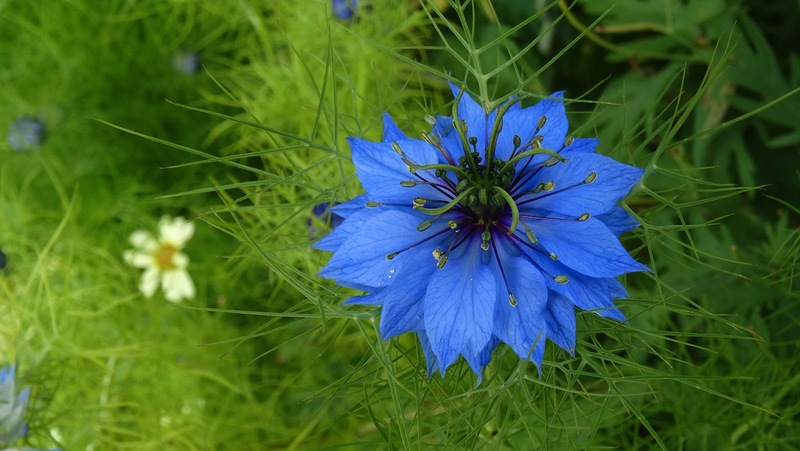 It is used in perfume making, has been written about as an aphrodisiac and is the state flower of US state, Florida. It is photographed in our garden, here, where it is currently in bloom. It is traditionally associated with good fortune and has been popular in bridal bouquets and head wreaths for weddings. Orange blossom essence is an important component in the making of perfume. The petals of orange blossom can also be made into a delicately citrus-scented version of rosewater; orange blossom water (aka orange flower water), a common part of both French cuisine and Middle Eastern cuisine (most often as an ingredient in desserts and baked goods). In the United States, orange flower water is used to make orange blossom scones and marshmallows. Orange blossom honey (citrus honey) is produced by putting beehives in the citrus groves during blooming period. This also pollinates seeded citrus varieties. Orange blossom honey is highly prized and tastes much like the fruit.